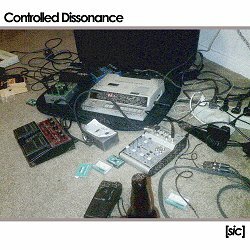 [sic], the latest endeavor of soft noise/dark ambient blowhard, Controlled Dissonance, is an expression of minimalistic composition. Stripping down to the bare bones, Controlled Dissonance culled the sounds for this release exclusively from field recordings and found material on microcassette. These recordings were manipulated with a transcription device, a handful of effects pedals and a small arsenal of digital effects. The resulting tracks both belie the humble origin of their source recordings, and elevate even the commonplace sounds of the world around us to new realms of ambience.